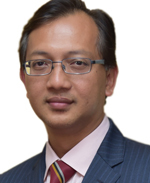 YB Haji Wan Abdul Hakim bin Wan Mokhtar was appointed to the Board of Terengganu Inc. on 25 September 2014. He is also a member of the Audit & Risk Management Committee and Strategy & Investment Committee. His foray into politics begin in 2008 when he was elected as a member of the Terengganu State Legislative Assembly. He subsequently took the role as Deputy Chairman for the Planning Committee, Finance & Investment, Land, Petroleum, Natural Resources, Tourism and Cultural Affairs followed by as Deputy Chairman for the State Trade and Industry Committee. In 2013, YB Haji Wan Abdul Hakim was appointed as the Chairman of Barisan Nasional Backbenchers Club (BNBBC) and Chairman of the Public Accounts Committee (PAC). YB Haji Wan Hakim gained his Master of Business Administration (MBA) from Imperial College, University of London in the United Kingdom. He also holds a Degree in Mechanical Engineering from University of Pennsylvania (Ivy League) in the United States of America.